Innovation is the buzz word these days, but how and what to innovate in your business or product range is often a difficult decision. Two things stand out; asking questions and listening to the answers of course. And passion, as you will find out in the interview I had with Hamish Whyte CEO of Furnware, a school furniture manufacturer with less than 40 employees when they started the innovation process. Q What was it that sparked the quest for a new design? Furnware was very aware that humans as a whole were all changing physically. We knew that students were bigger and taller than they used to be. Avoiding the race to the bottom (of price and quality) we wanted to create a differentiation of product from the market – NZ economies of scale cannot compete with larger economies. Design – that was fit for purpose, school furniture to assist with teaching and learning and children’s development. Q What were the first steps you took? Furnware owner Hamish Whyte travelled the world, attending international furniture shows to learn what the world is doing We discovered furniture trends and were confident that we were as close, if not closer, to customers than most companies and as a result we didn’t feel intimidated by international design. We liaised with academia, including Unitec industrial designer Murray Pilcher. The rest is history. Q What convinced you that you were onto something good? Murray asked us, “Tell me about your customers” – and we realised that we had their customers all wrong. It wasn’t about the teachers, it was about the kids. This question started a journey to true student-centric thinking. To answer this question, we realised we needed to go back to school and learn. This highlighted what we knew from our own experiences but what was more evident as an observer was that there was fidgeting and discomfort in the room. Q What was it that made you decide to invest heavily in the project? It just seemed logical – from what we were observing and the information we were getting. Once we had absorbed and embraced this knowledge and its conclusions it became glaringly obvious that change was absolutely needed. Focus needed to be around the student not the manufacturer. It was evident that everybody is different – one size does not fit all. Q Who was the most helpful in the process? Apart from Murray and our design team and senior management – it was the students and their teachers who were the catalyst of our journey. Q What was the input from internal resources and external such as “advisers” and scientists? Mixture of both – University studies, measuring programme, project researcher, educationalists, designers, account managers, NZTE. Once we asked what was going on it seemed everyone wanted to be a part of the research. Massey, Waikato – many people contributed to the research and were excited that we were interested in what they’d done- people had been independently working on similar things, but there had never been a practical application for the findings. As part of the process Furnware decided to measure 20,000 students in NZ of various ages and sizes. By involving 20,000 people it empowered us and it gave us a mandate to continue as what we found proved to be highly valuable. There was now a massive expectation from customers. We had opened Pandora’s box and knew what needed to be done. We had a moral obligation to do it. Q What surprised you most in the whole process, or what was the most unexpected issue? The amount of time it took and the cost – not only tooling and research but time. It was a project that you couldn’t fast forward or skip – it was a pilgrimage. Management thought we had reached the end of the research and development until someone asked about colour. We engaged with a colour expert who steered us away from primary colours. We had no idea that colour and design would make the classroom calmer – that hadn’t entered the thinking previously. It had been much more about the ergonomics of the Bodyfurn design. Q Were you at any stage thinking of giving it up? What made you continue? Many times we talked about stopping or cutting corners but, at the end of the day, the emotional and physical impact on the students and teachers was too great – they didn’t want to give their trial furniture back. Q What is your advice for others who are thinking of developing a product or process? Test your assumptions and knowledge about the customers – you may be surprised! It’s always going to take longer than you think – that’s the power of research and design, until you explore, you don’t know. Your team needs to become the world’s greatest listeners – live as if you’re your own customer. Know more about the customers’ situation than they do, because if you add value to their lives then you’re on a GREAT journey. 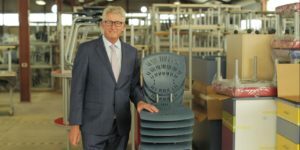 Furnware is a Hastings NZ based company. They employ over 150 people, run two shifts and have made a significant investment in machinery and production equipment. 95% of components are New Zealand made. Look them up www.furnware.co.nz. As you may have noticed CAD product design does not feature greatly in the story, but without it, the cost and time would have increased dramatically. As you may find when you come across this product, cleverness and simplicity is beautifully executed.